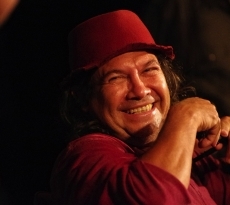 Stephen Pigram, an indigenous folk musician from the pearling town of Broome, Western Australia, performs vocals, acoustic guitar, harmonica, requinto guitar, valiha (a bamboo tube zither from Madagascar), ukulele and dulcimer as part of folk/rock septet The Pigram Brothers. As lead singer and songwriter of The Pigram Brothers, Stephen and his brothers opened the Deadly Awards at the Sydney Opera House and bought home the Deadly Award for Album Release of the Year (2006). In the same year, Stephen and brother Alan Pigram were the first indigenous artists to be inducted into the West Australian Music Industry’s Hall of Fame. The Brothers’ latest CD release Under the Mango Tree was nominated for the Best World Music Album ARIA Award. From 1983-95 Stephen was a member of the band Scrap Metal, with brothers Alan and Phillip, which recorded four albums, toured nationally with Midnight Oil and won the West Australian Music Associations Best Indigenous Act award (1992). As part of Kuckles, another Broome-based band, Stephens was heavily involved in Broome’s famous musical theatre productions “Bran Nu Dae” and “Corrugation Road”. The Pigram Brothers’ debut album Saltwater Country was voted best debut album at the National Indigenous Music Awards.